Fall is when Canadians start looking for hearty comfort food. But dishes that warm the soul don't have to be the calorie bomb we often expect. Check out this healthy twist on a classic comfort food. 1. Preheat oven to 350°F. Lightly coat a 9-inch square baking dish and a large baking sheet with cooking spray. 2. Place a large nonstick skillet, lightly coated with cooking spray, over medium-high heat. Add oil and onion and sauté for 3 minutes. Add garlic and carrots and sauté for 3 minutes. Add ground beef and sauté for 5 minutes or until no longer pink, breaking up the meat as it cooks. 3. Add flour and cook for 1 minute. Add tomato paste, stock, tomato sauce, basil, salt and pepper. Cover and cook on low heat for 3 minutes or until thickened. Add edamame and cook for one minute. Place in baking dish. 4. While meat mixture is being prepared, place squash onto baking sheet and roast for 25-30 minutes, until just tender. Place in a bowl and mash, adding corn oil, grated parmesan, salt and pepper. 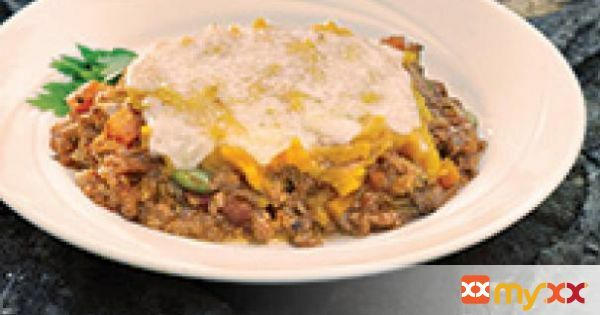 Spoon over meat filling, sprinkle with cheese and bake for 5 minutes. 5. Full nutritional information and more recipes by Rose Reisman are available at www.makegood.ca.